The number of soccer (more commonly known as football by the rest of the world) stamps is huge. It would take a long time and a fair bit of money to complete a collection. Over 13,000 different soccer stamps have been issued by over 270 countries. This just reflects how big the beautiful game of soccer really is. The world’s first soccer stamps were issued in 1924 by Uruguay. They issued 3 stamps to celebrate their victory in 1924 Paris Olympics final where they beat the Swiss 3 - 0. The stamps were a 2-cent red stamp, a 5-cent purple stamp, and a 12-cent blue stamp. The world’s greatest player ever, Pele is featured on stamps from many countries. A 17-year-old Pele helped his country, Brazil, win their first World cup in 1958. He was a prolific goal scorer for this club and country. He scored more than 1200 goals in his career. 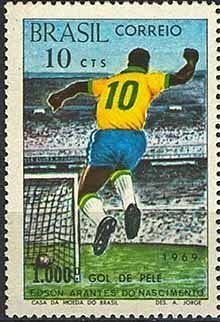 To celebrate his 1000th goal, Brazil issued a 10-cent stamp showing him jumping in celebration and the ball in the net. His 1000th goal was penalty. It is not just Brazil that has honored him on stamps. Some other countries that have stamps dedicated to him are Nicaragua, Cameroon, Chad, etc. In 1966 soccer (football) came home with England winning a dramatic final against Germany with a controversial Geoff Hurst goal (did the ball cross the line? See below). Also the commentary “They think it’s all over. It is now” as the fourth goal was scored making 4 – 2 to England. To celebrate this momentous win, the Post Office re-printed the 4-penny stamp it had issued for the 1966 World Cup and added England Winners. There was a rush to buy them by dealers and collectors because it was thought they would be scarce. It was not the case and it is estimated there is more than 10 million in existence today. The latest stamps to feature football have need issued as part of the 2012 London Olympics.